At Twenty Over Ten, we are committed to helping all of our users improve their local SEO. For many advisors, SEO can be a tough concept to integrate into their website and digital marketing plan. However, optimizing SEO can take your online presence to the next level so its important to keep up with the latest strategies. As SEO continues to evolve and Google rolls out even more algorithmic updates, achieving top listings with local search results means transforming how you create content, optimize your site and track performance. 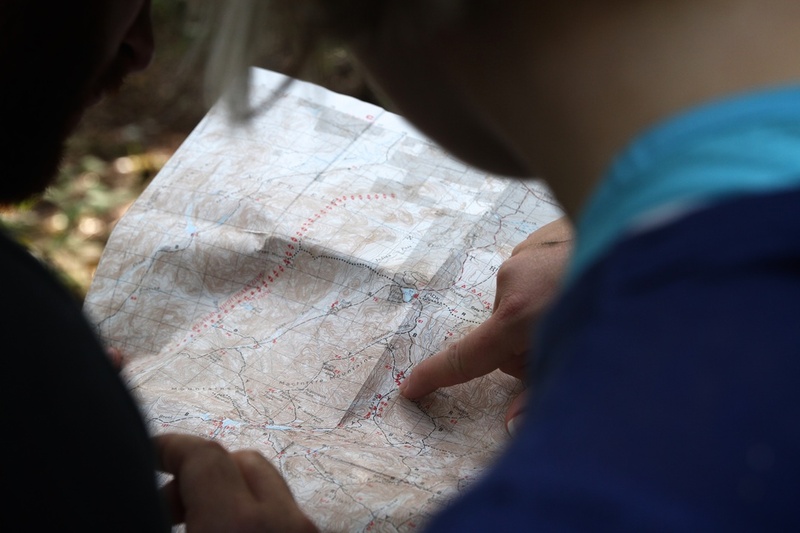 Our tips below will help you understand and execute local search best practices for your business to improve your local rankings on popular search engines like Google. Meta descriptions can influence the decision of the searcher as to whether they want to click your content from search results or not. Meta descriptions on Google is the text that displays in grey below the URL in a search. The above is how a meta description is displayed on Google. The more descriptive, attractive and relevant the description you create, the more likely someone will click through. It’s important advisors take advantage of this space they’re given but use it wisely. Google only gives us a limited amount of space so it’s important to double-check that your descriptions are optimized and not getting cut-off in search results. Keywords: Ensure your using your most important keywords. Search engines will often bold those keywords in results when searched. Readable copy: Your meta description should be legible and read like a human wrote it, don’t keyword stuff your descriptions. Length: A meta description should be no longer than 135-160 characters long. A longer description will be cut off by search engines to ensure your important keywords are upfront. Don’t duplicate: Meta descriptions must be written differently for every page of your site and your blog. If not, Google will penalize you for any duplication. Learn how to add metadata to your Twenty Over Ten blog and your webpages. When it comes to local link-building for SEO, many financial advisors don’t know where to start. Columnist Pratik Dholakiya shares his tips and suggestions for what small business owners can do to improve their site’s local search SEO in a post via Search Engine Land. We’ve referenced Dholakya’s advice and tailored it specifically for financial advisors in this post to help guide you through this process. Niche-specific influencers have connections with readers that bypass the “industry atmosphere” and form meaningful relationships. You can establish content partnerships with influencers who serve relevant content to your target audience. If you’re addressing people in a particular geographic area, then forming partnerships with local organizations can be an opportunity to get backlinks from their websites. In that case, you may already have existing partnerships, so all you need to do is get in touch with partner websites for link placement. Think about locally owned businesses you already may share referral business with. You can also replicate the first link-building strategy by contributing to local blogs. And apart from local business blogs, you may come across official community blogs and local news blogs that welcome guest contributions. Another thing you can do is sponsor local events that cater to small businesses. This can get you links from the event’s sponsorship page. Trinity Financial Planning partners with niche-specific influencers and leverages local partnerships. They are frequently quoted in the news and asked to give their input. They have a section on their site, “Read Our Quotes In The News,” and this builds inbound, quality links. Discover top-performing content in your niche. Top-performing content can be determined based on the number of times it has been shared on social media or the quality of links pointing to it. You can use a tool like BuzzSumo to search the content that has performed well and a tool like Open Site Explorer to analyze the quality of its backlinks. Create something better. Perhaps the top-performing content is low on practical examples or case studies. Or maybe it doesn’t go into as much detail as it could. You can deliver more value on the same theme by creating a more in-depth or comprehensive piece of content on the same topic. Promote your content via outreach. Reach out to relevant websites and influencers via email and social media. (Hint: Look at websites and influencers that are already linking to the content you’re improving upon.) Give them a heads-up about the new piece, and that includes the most recent information and examples. The skyscraper technique is also considered “content marketing for link builders.” Various reports reveal that this technique has helped businesses build organic links and drive traffic to their websites. Finding business mentions that do not include links on community resource pages, forums and so on is a convenient and cost-effective way to build links. In addition to using the brand name when trying to uncover backlink opportunities, use other relevant keywords that would be listed on the page in addition to your business name to narrow down your search. With BrandMentions, the web mentions database, you can discover mentions of your business and relevant keywords in the last 24 hours, last week and last month. Choosing “English” as the preferred language will further narrow down mentions. 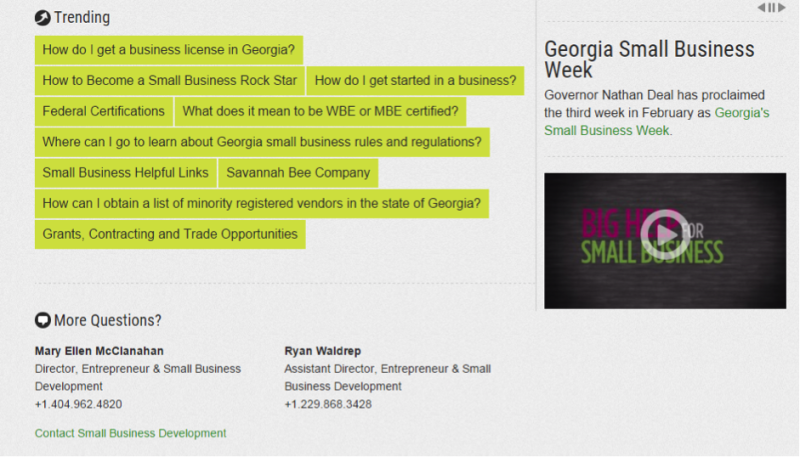 BrandMentions can be used with Google Alerts to research new mentions. After you click on a particular URL, use CTRL+F (find function) to search for your brand on the page. You may find articles that are dedicated to your financial advising firm or indirectly mention your firm but don’t include a link to your website. Get in touch with the authors of these articles and ask for link insertion. Depending on your locality, you can create a local resource page that includes useful information for small businesses in your area. When you provide useful information, other businesses (even competitors) will link to your resource page. You can partner with local subject matter experts to create information-rich resource pages; the efforts put into these pages will pay off once they capture the attention of businesses in the industry. A resource page can then be cited when participating in Q&A websites and local business forums. It might even land you interviews and guest appearances (webinars, podcasts and so on), providing opportunities to build links from participated content. Also, check sites like Help a Reporter Out for additional linking opportunities. If you want to get backlinks from major publications and leading industry blogs, you need to create premium content — content that demonstrates thought leadership and isn’t just a complication of tips or lists from other financial advising blogs. While premium content pieces require more time for completion, they have a much higher chance of being linked to than a standard blog post. Partnering with other businesses that are not direct competitors can cut costs while giving all partners an opportunity to attract authority links. 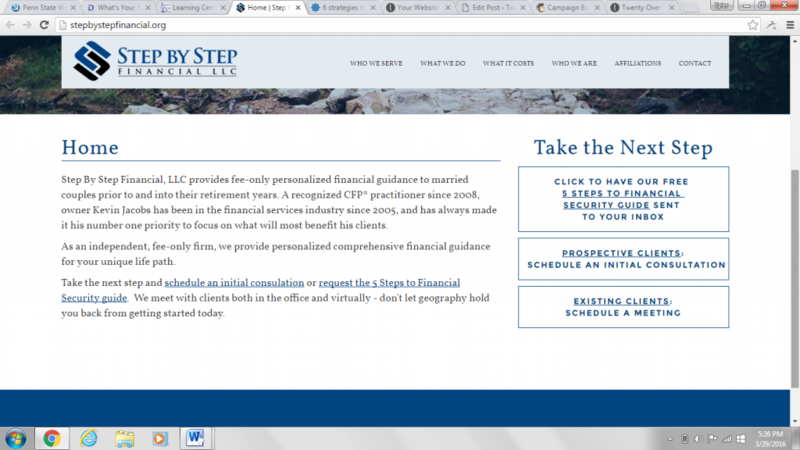 Step By Step Financial has a “5 Steps to Financial Security Guide” that is linked in both the copy of the page and as a button on the right of the page. Before your competitors gain an edge over your website in SERPs, make a resolution to jump on the link-building bandwagon. 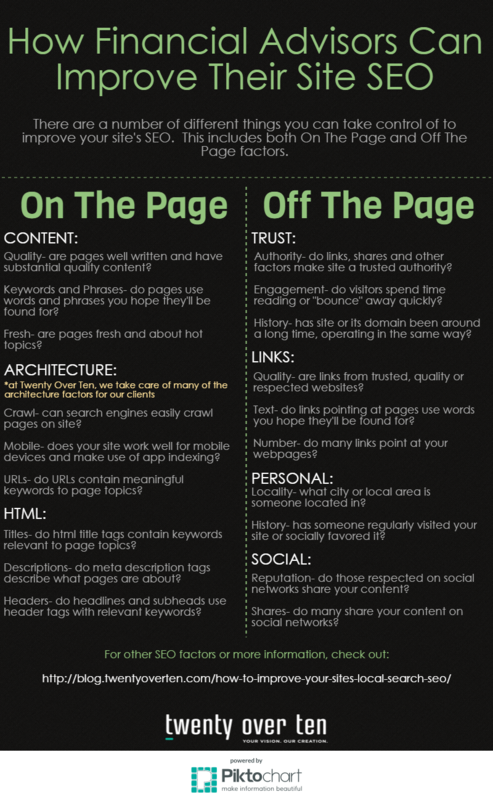 The strategies mentioned above will help you gain links and enjoy better search rankings for your website. Google and other search engines WANT you too use h1 tags. Why? So their crawlers can learn and understand what your web page is all about! This is how search engines reflect the best results when someone is searching for keywords. To help your business show up in these results, be sure to use keywords in your h1 tags. However, make sure your keyword use is natural and not stuffed into h1 tags. An HTML tag is a fragment of code that communicates to the web browser how to display content. Tags can be used to display various types of information. The tag <body> defines the body paragraph of copy on your website. The tag <img> communicates to the web browser to display an image. There are many different tags, but today we’re going to dive into heading tags. 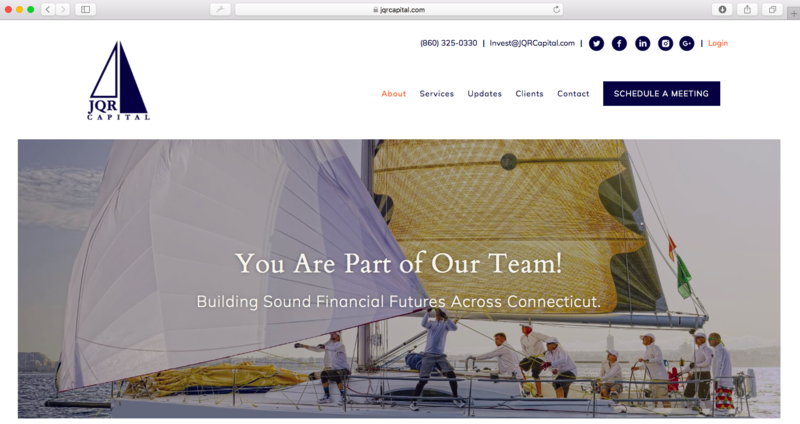 Twenty Over Ten client, JQR Capital, uses the geo-location of Connecticut in an h2 tag on their website. There are six different heading HTML tags: <h1>, <h2>, and so on to <h6>. The h1 tag is considered the most important tag in a search engine’s ranking, and it appears as the largest heading on web pages. The h6 tag, in comparison, is considered the least important and is formatted to be the smallest heading on the page. We have found that the most advantageous way to use h1 tags is to optimize them for local searches only. By using a location in h1 tags, your website’s and web page’s SEO ranking for that location rise. Even if your firm conducts business nationally or internationally, concentrating on growing your local search and local prospects can greatly progress your overall financial advising business. Competing with the advisors in your local area is a much more attainable goal than competing with every advisor in the country or world. Check out our step-by-step tutorial to learn more about how to edit your header tags in the Twenty Over Ten app. One of the simplest things you can do to improve your site’s local search rankings is claim your Google My Business profile. Optimizing your profile with updated categories, contact information, images and business hours can give you a huge boost in local search rankings. 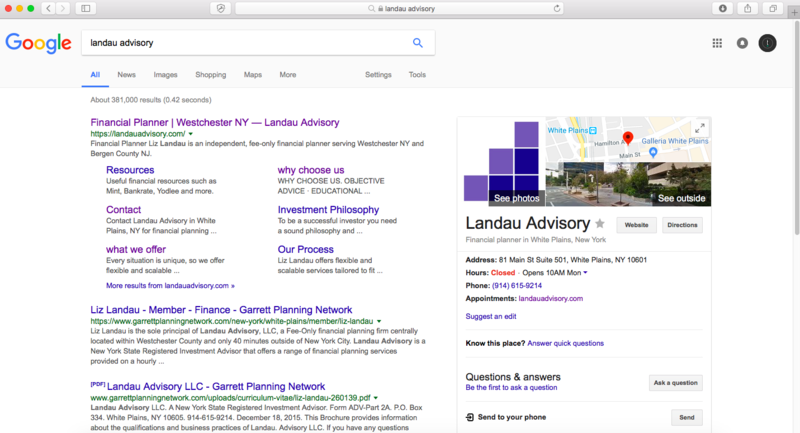 Twenty Over Ten client, Landau Advisory, has their Google My Business page setup. The largest issue we come across quite frequently with financial advisors in setting up their Google My Business listing is the address you provide. You HAVE to have a physical location and street address (not a P.O. box) to set up or claim a listing. Did you know that those who blog regularly generate about 67% more leads? One of the easiest ways to get your unique message heard is by including a blog on your website, and then sharing those blog posts on social media. 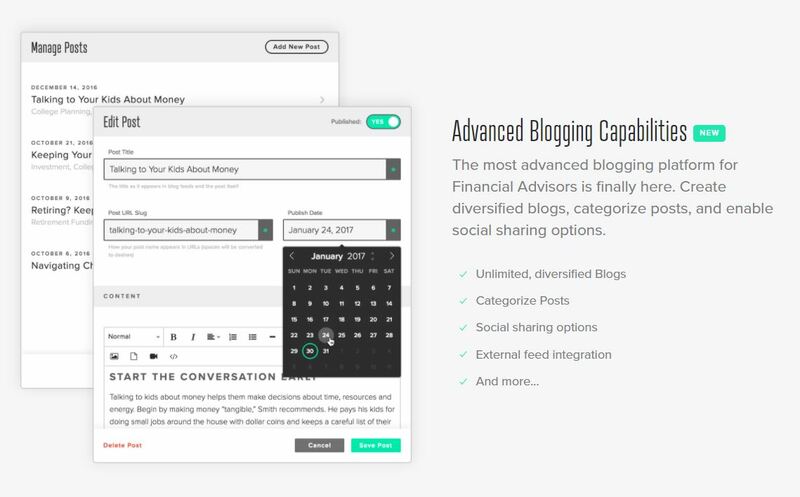 The Twenty Over Ten platform is the most comprehensive blogging and archiving experience on the market for advisors, enabling you to create diversified blogs, categorize posts, enable social sharing options and much more! There are many advantages to blogging for local SEO. Google loves fresh content and blogging is a great way to continuously add fresh content to your website. When planning your editorial calendar and writing your blog posts it’s important to do some keyword research first. Tailoring content and keywords around heavily searched subjects, even if they are in demand for only a few days, can increase your chances of popping up in Google’s first page search resultsand improve your SEO. Getting involved with national trends can be a lot of fun, but your marketing strategy will benefit from additionally entering less competitive trending topics relevant to your target market or local area of business. You want prospects to be able to easily find you online, right? This requires your site to have SEO optimized content. This not only applies to the main pages of your website but also includes publishing regular blog posts with trending industry keywords. Whether you take the DIY approach to sprucing up your website content or you seek outside help, content clutter is a clear sign of your site being outdated. Our platform makes it easy to add and update content on your website. You can add unlimited landing pages at anytime to invite clients to your holiday open house or to inform them of your new office location. Some of the advisors we work with even create new blog posts every week to keep their clients engaged. Content is still king and we’ve made it easy. updates (aka your posts to LinkedIn). Twenty Over Ten‘s SEO setup package delivers maximum impact by completing the most important SEO tasks in regards to how your website is setup and registered with Google.